Ammo Cans to keep your outdoor gear dry and protected! Original US Military surplus small arms ammunition cans used by our troops to transport a variety of calibers of ammunition/ordinance/tracers. Steel construction with removable lid and gasket seal. Folding flat top handle for carrying, lever-latch lid. 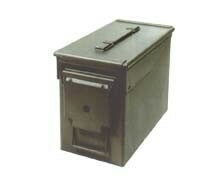 These are ideal for storing ammunition, and geocaching. Stackable. Minor surface rust on some due to long-term storage. A little WD-40 makes 'em look great. Satisfaction guaranteed. Lidded and empty. Ammo can's are referenced/named/sold by size, not labeling. We can not select by labeling. For example "50 Caliber" is the size of the ammo can, not how it is labeled. Ammo Can labeling does vary. The can may say, but isn't not limit to: 50 cal, 5.56mm, caliber, caps, tracer, blanks, explosives, ordinance. The label may be painted over with any color of spray paint. They may have been relabeled or marked with a pen. There may be duct tape on the can.